addiction in all their biopsychosocial complexity. Elsewhere in Volume 29, contributors review neuroimaging studies in an effort to shed light on adolescent psychiatric disorders (Day et al. 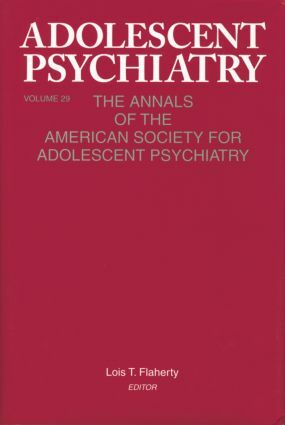 ); reevaluate the construct of borderline personality disorder as it pertains to adolescence (Becker & Grilo; Paris); and present the encouraging results of a pilot project on the psychodynamic psychotherapy of adolescents with panic disorder (Milrod et al.). A case series on the treatment of hospitalized adolescents who deliberately ingest foreign objects (Petti et al.) and a case study of the cross-cultural issues that arose in the therapy of an Asian American adolescent (Shen et al.) enlarge the clinical and cultural scope of the volume. findings, empirical clinical studies, case series, and descriptions of clinical approaches all take their place in this illuminating and richly textured collection. Part I: Special Section on Adolescent Substance Use and Addiction. Rosner, The Scourge of Addiction: What the Adolescent Psychiatrist Needs to Know. Havivi, Substance Abuse in Teens: A Clinical Approach to Assessment and Treatment. Bartzokis, Brain Myelination in Prevalent Neuropsychiatric Developmental Disorders: Primary and Comorbid Addiction. Grob, The Enigma of Ecstasy: Implications for Youth and Society. Fong, Pathological Gambling in Adolescents: No Longer Child's Play. Miotto, Davoodi, & Maya, Gamma-hydroxybutyrate (GHB) and Ketamine: Effects and Treatment of Toxicity. Part II: Development, Psychopathology, and Psychotherapy. Day, Chiu, & Hendren, Structure and Function of the Adolescent Brain: Findings from Neuroimaging Studies. Becker, Grilo, Validation Studies of the Borderline Personality Disorder Construct in Adolescents: Implications for Theory and Practice. Paris, Diagnosing Borderline Personality Disorder in Adolescence. Petti, Blitsch, Blix, & Sims, Deliberate Foreign Body Ingestion in Hospitalized Youth: A Case Series and Overview. Milrod, Busch, Shapiro, Leon, & Aronson, A Pilot Study of Psychodynamic Psychotherapy in 18- to 21-Year-Old Patients with Panic Disorder. Shen, Chiu, Lim, Cross-Cultural Issues in Therapy with an Asian American Adolescent. Lois T Flaherty, M.D., is a child and adolescent psychiatrist on the teaching faculty of Harvard University and the University of Maryland School of Medicine. A past president of the American Society for Adolescent Psychiatry and a consultant to the Center for School Mental Health Assistance in Baltimore, Dr. Flaherty remains active in school-based mental health programs and community psychiatry.